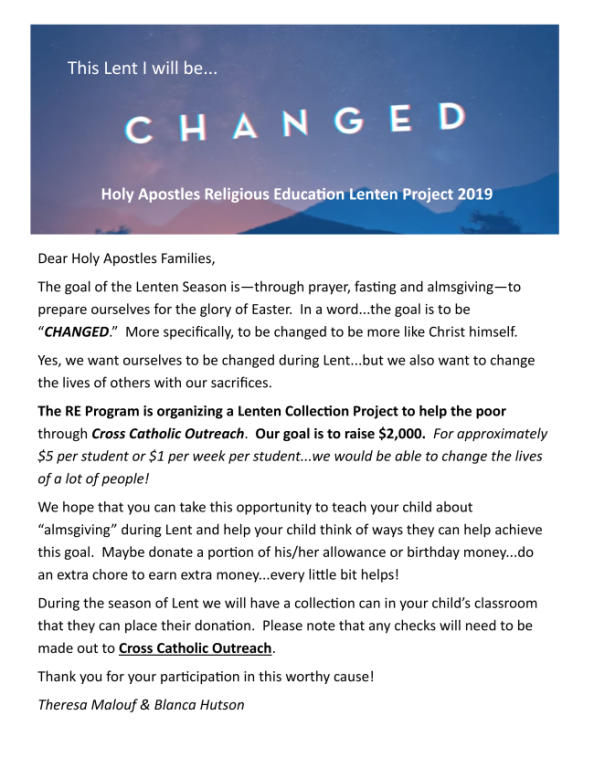 The band's song "Changed" was the perfect theme for our Lenten Season..
Holy Apostles Religious Education strives to be a joyful place where children can form relationships, learn that God loves them, grow closer in relationship with Jesus and begin an understanding of the Catholic faith. Each year classes begin in September but we can add children to the program all year long. It's never "too late" to make disciples! We're here to serve you and your family. Or click here for a paper form to complete and return. Classes are held during the 9am and 11am Masses on the 2nd an 3rd Sundays of the month. Registration for the new class year begins in late July, however if there is room in the classes, we can add children throughout the year. The Curriculum used for this age group is the "Stories of God's Love" series published by RCL Benziger. Click here for Parent pages and activities on the Publisher's Website. The class year runs from Sept. 17 through April 23, 2019. During this time, we follow the West Ada School District Traditional calendar for Holidays... if the schools are out of session on Monday, we will not have Religious Education classes on Monday or Tuesday that week. We begin Registration for each new class year in late July. The Curriculum used for this age group is "Be My Disciples" published by RCL Benziger. Click here for the publisher's website. Click here for information on preparation for First Reconciliation and First Communion. What: At Holy Apostles, we call Children's Liturgy of the Word "KidsWord". This is a program led by the Volunteer KidsWord Team where children attend mass with their family and are led out of the Church to the Day Chapel during Liturgy of the Word. In the Day Chapel the children hear the Gospel and a "kid-friendly" interpretation of the Scripture and usually receive something to take home to help remember and share the message they heard. Who: This program is geared to children who are 3-years-old through 2nd grade. Older children are encouraged to remain in mass with their family. When: KidsWord is held during the 11 am Mass - 2 Sundays a month (on the 1st and 4th Sundays). Why: This schedule allows the children who are attending a pre-school/Kindergarten RE classes on the 2nd and 3rd Sundays of the month... an opportunity to attend mass but still receive a message at their comprehension level. And, it gives the children who are visiting or who are not registered in RE a place to better comprehend the Gospel message with their peers. How: There is no registration needed for this program. Children attend mass and sit with their family. They follow the KidsWord team to the Day Chapel when called... and return to their families during Preparation of the Gifts.